St. Patricks Day is full of old traditions and new experiences. One of my favorite foods to eat during this time of year is Smoked Corned Beef. It pairs super well with a Guinness, and is very versatile. We would make sandwiches, bowls and more from this one cut of meat. But, what is it? Corned Beef is typically beef brisket that has been soaking in a salt brine for a period of time. It is actually called corned beef because the salt that is used to brine it is larger grained, therefore called “corns”. 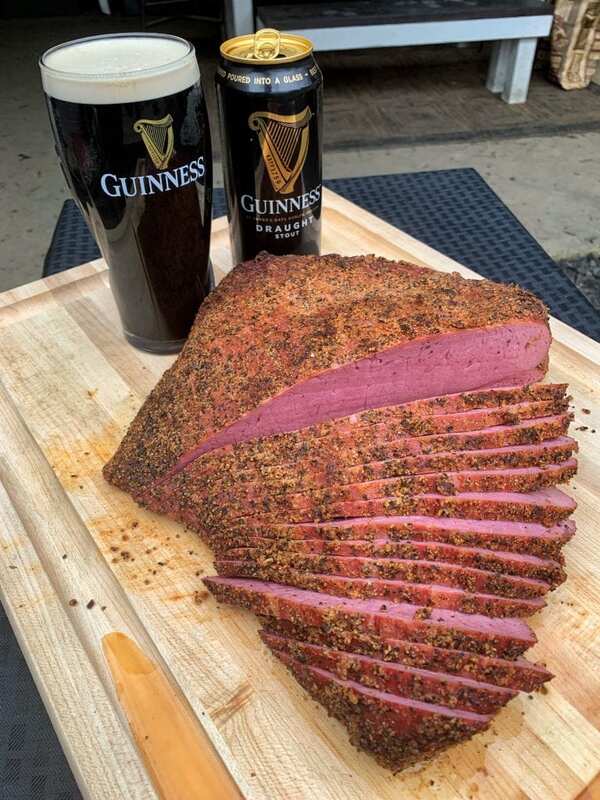 The meat tends to be extremely flavorful because of the brining process, and has become a staple piece for St. Patrick’s Day. However when you do smoked corned beef, then you are breaking that norm! How Do We Cook It? Corned beef is traditionally boiled. While I have fond memories of this, I thought it would be fun to spice things up this year. We are gonna do smoked corned beef over fire instead! Basically, we will smoke the corned beef over fire until it reaches about 170F internal. Next, we will pull it off and place it inside of some tin foil with some Guinness. It will then go back on the smoker for another hour or two until it reaches 200F. Then It Becomes a Sandwich? Oh yeah! We will slice into that smoked corned beef and place it on top of some rye bread. Add some swiss cheese, sauerkraut & dressing to make it perfect. Pour yourself a pint of Guinness and you are ready to party! In the end, holidays like St. Patricks Day are about exploring new ways of cooking classic dishes. 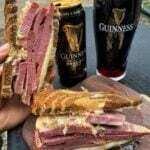 With this Smoked Corned Beef Sandwich w/Guinness you will definitely be enjoying what the Emerald Isle has to off right in your own backyard. Slainte! 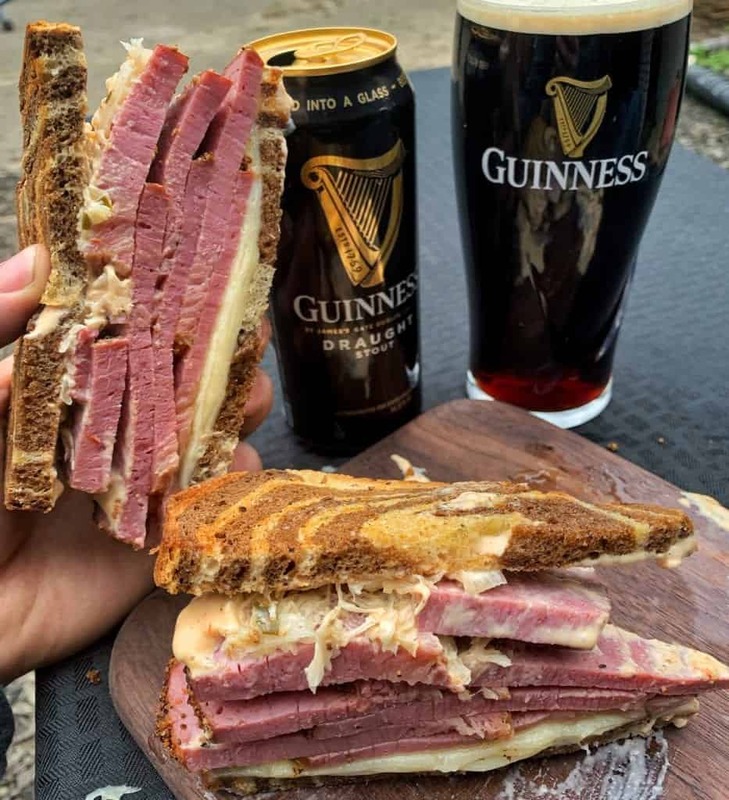 Smoked corned beef made into a sandwich that pairs perfectly with a pint of Guinness just in time for St. Patricks Day! Take pre-brined corned beef brisket out of bag and discard seasoning. To reduce the amount of salt from the brining process, submerge beef in water for 2 hours and place back in fridge. You can skip this if you like. Pull corned beef out of smoker. Lay down 2 sheets of tin foil and make edges. Pour Guinness Beer & Beef Broth over top of meat and into tin foil base, then cover and place back on the grill till it reaches 200F internal (about 1.5-2 hours). Once done, pull out corned beef and let rest in a cooler for 20 minutes. Slice against the grain and serve with melted swiss cheese, rye bread, sauerkraut and Thousand Island dressing. Pour yourself a Guinness and enjoy! 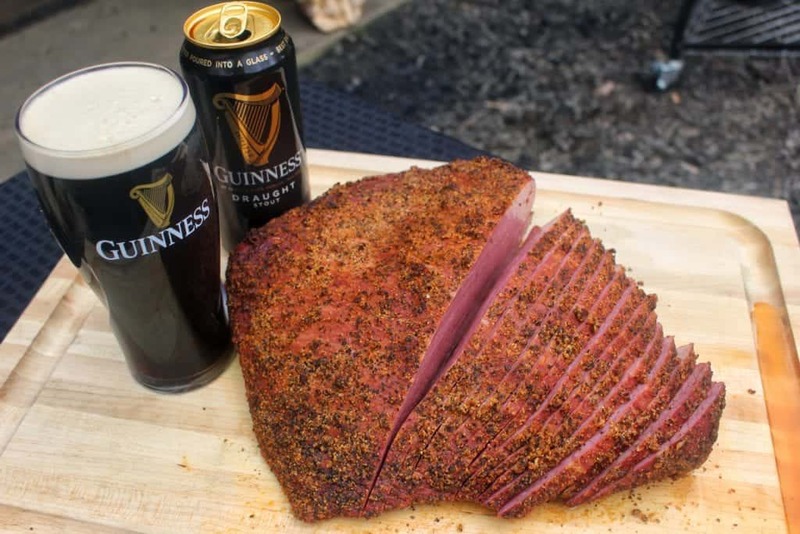 Equipment: Guinness pint glass, tin foil, smoker, wood chips, cutting board and knife. This article does contain affiliate links to products that we personally use and support. Purchasing an affiliate product does make us a small commission at no cost to you. This helps us continue creating for our website. All words and opinions are our own, and we appreciate your support!